KLAIRS Vitamin E Mask | Really gives Bright & Glowing skin? KLAIRS Freshly Juiced Vitamin E Mask – I’ve been using such an awesome hydrating mask like this after quite a while. This Vitamin E Mask is a new addition to the Klairs skincare range that just launched a while ago at Wishtrend. I’ve been using this Klairs Mask for a couple of weeks now and it didn’t take me long to fall in love. I haven’t used much product by Klairs before, just the Supple Preparation All Over Lotion and their cotton pads (I’m freak about different types of cotton pads). I love the all over lotion and in fact still using it for my body. Needless to say, It was exciting for me to give this new product by Klairs a try. The name, Freshly Juiced, kinda describes how juicy it is for the skin. This Klairs Mask is also a multifunctional product that can be used as a mask, sleeping pack or daily moisturizer just by maintaining the amount according to your skin need. Vitamin E – is an oil, which is super moisturizing and full of anti-oxidant. Niacinamide (2%) – A well-known ingredient to reduces pigmentation by balancing out the formation of melanin. Adenosine – Anti-inflammatory property, effective on healing and regeneration thus effectively improves acne. High concentration of it serves the function of improving wrinkles. I have to appreciate the elegant glass looking jar that comes with a spatula. The mask smells something very shooting, I can’t really recall a similarity but I like it. I usually apply a face mask with a flat brush. Also if the packaging is jar type, I just dip the brush directly onto that to pick up the product. Initially seeing it I expected this Klairs Freshly Juiced Vitamin Mask to be like all other masks. When I dipped the brush in it, it tricked me 😅 Felt so stupid and laughed at myself for a moment. On the jar, the mask looks like all other cream mask but it’s nothing like that. This has a pudding-like texture, not even a gel mask; Klairs call it ‘Shape Memory Cream’. Totally reminds me of Astalift Jelly Aquarysta; no matter how much you stir this jelly/pudding thing it goes back to an even shape after a while. No matter how much you use you’ll find a neat jar every next use, it’s super fun! I’ve been using this in many different ways so far as it claims. Leave-on typical mask way, as a moisturizer also as an overnight mask. In a typical leave-on way it is fantastic. I’ve used it literally any time of the day, lat on my face for 15-20 minutes. After washing off the mask it always gave me a refreshed skin. It was like an instant skin soothing magic. I’ve used it as a sleeping mask. Sometimes used it alone instead of moisturizer, sometimes mixed with serums I’ve been using. I liked it better alone. For the past few days, at night, after the WishTrend Mandelic Acid Skin Prep Water, I tap a few drops of Nutox Renewing Treatment Lotion, then apply The Ordinary Advanced Retinoif 2%. Give my skin a 10-minute break then use a few pumps of Nutox Renewing treatment Essence and lastly slather Klairs Freshly juiced Vitamin E Mask all over my face. Of course, I was careful with the amount I was using. Just as much I needed because I don’t like to go to bed with a sticky face. I tried to use this Vitamin E Mask as a day moisturizer but I didn’t really like it that way. As a daily moisturizer, this mask is way too sticky for me to handle. Even with my supper matte sunscreen, Murad City Skin Mineral Sunscreen, it was being sticky within just 30 minutes. As a normal mask, it is super soothing and skin reviving. It gives a visible freshness just instantly. Whenever my skin feels tired nowadays I’m finding myself opting for this straight away. 15 minutes and BAMM! My skin is revived from dullness and plumped with hydration. My skin kinda feels RADIANT and firm too! As a sleeping mask, it is great as well. Every morning It does help me to have a nourished and glowing face. However, I ended up with the feeling that I don’t like to use the mask this way. Mainly because my skin is combination type and Klairs Vitamin E Mask gets a bit too much with all my other pm-skincare. I’ll go back to a normal, non-sticky, moisturizer. Trust me it is not about this mask at all but it’s me, I guess I don’t like to use sleeping mask anymore. About it claims on anti-aging benefit – can’t really state anything so quick. But the way it revives my skin from tiredness and dullness gives me a feeling it is definitely going to prevent age signs as well. Klairs Freshly juiced Vitamin E Mask claims to be more functional with Vitamin C. Which I can’t tell you anything about cause I’m not using any Vitamin C Serum right now. I might get the Klairs’ Freshly Juiced Vitamin C Drop or the I’m From Ginseng Serum (again) soon to try the mask out with. 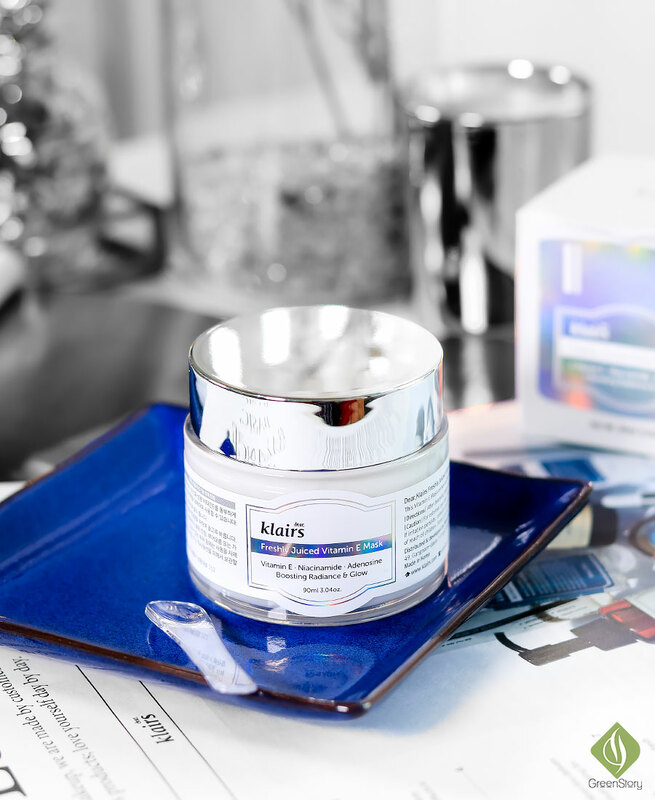 Overall, this Klairs Freshly Juiced Mask is simply a Korean skincare gem! – yes, without a doubt! For a dry skin to normal skin people, with all that Vitamin E and other benefits, it will be a magical hydrating mask. And it will work amazing as well for oily to combination skin type. I feel this mask is quite appropriate for young skin as well. Shop from Wishtrend Website directly. They always have a lot of attractive promotion going on and they offer international shipping with std and fast option. Free worldwide shipping on orders $69 or above and most of the time Wishtrend offers Free Shipping for many exclusive products. BONUS: You can receive a 5$ coupon instantly if you use my code ‘146262906’ upon signing up. Key in the Code when asked for ‘SPONSORSHIP PROGRAM’ code on the registration form. 30% OFF and FREE 3x Sheet Mask. How does it works with i’m from ginseng serum? Laneige BB Cushion Anti-aging | Differs from Pore Control & Whitening?